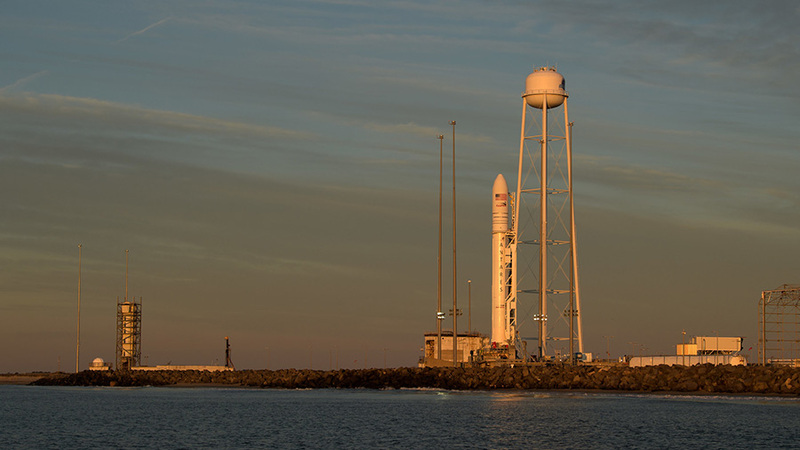 The U.S. Cygnus resupply ship from Northrop Grumman is encapsulated atop the Antares rocket and standing at its launch pad in Virginia. The Expedition 59 crew is training for its capture at the end of the week in the midst of ongoing life science aboard the International Space Station. Cygnus will blast off Wednesday at 4:46 p.m. EDT from NASA’s Wallops Flight Facility. It will deliver about 7,600 pounds of science, supplies and hardware to the orbital residents. Flight Engineer Anne McClain, with astronaut David Saint-Jacques backing her up, will command the Canadarm2 robotic arm to reach out and capture Cygnus Friday about 5:30 a.m. The duo continued sharpening their robotics skills today as they practiced Friday’s Cygnus capture maneuvers and techniques on a computer. NASA TV will broadcast the space freighter’s launch and capture activities live. McClain started the day setting up a mouse habitat that will house rodents to gain insight into the immune system’s response to long-term spaceflight. Saint-Jacques set up the 360° camera in Tranquility module for more virtual reality filming of crew life on the station. Flight Engineer Christina Koch started Tuesday collecting and spinning her blood samples in a centrifuge for the Myotones muscle study. She then joined NASA astronaut Nick Hague for body measurements and ultrasound scans to research how microgravity impacts the biochemical properties of muscles.